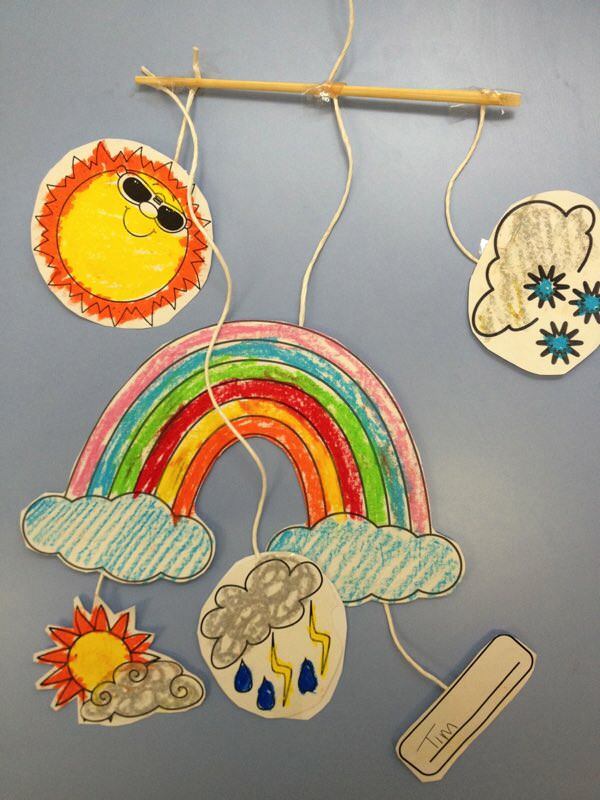 This months study theme was The Weather so I needed a nice bright and colourful craft to hang in the classroom. 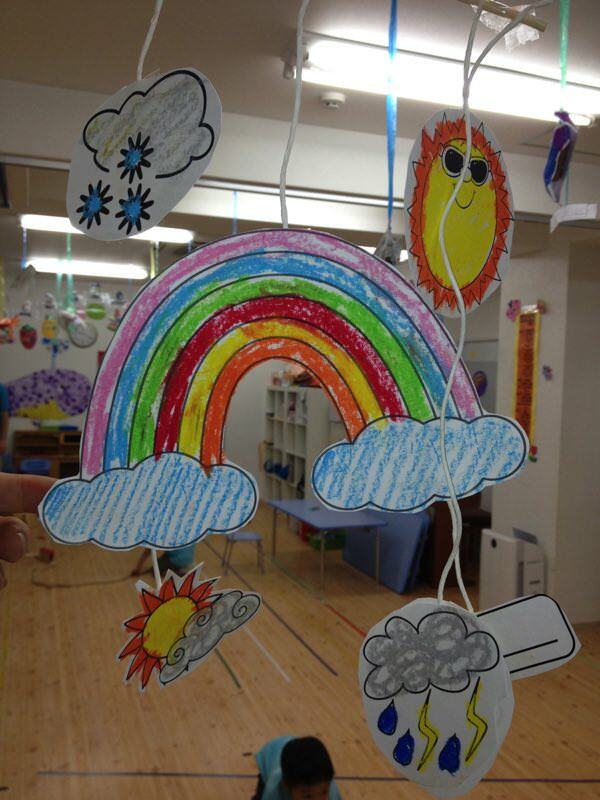 My International Pre-School 5 and 6 year olds loved this Clouds and Rainbows Weather Mobile - Tim Sensei ティム先生. 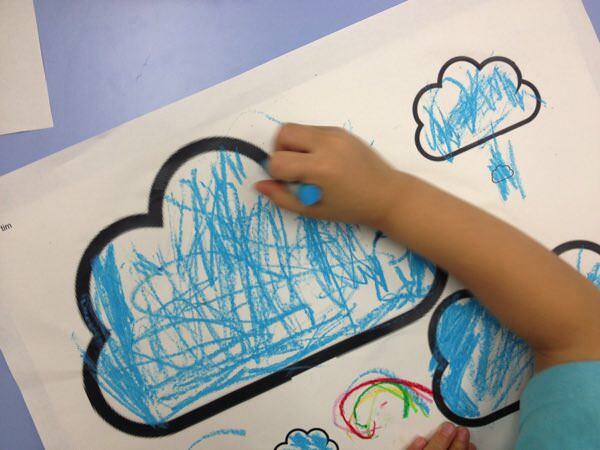 Find a nice image of a cloud and copy 5 of them onto a page, making each one progressively smaller than the last. Print this on A3 paper. 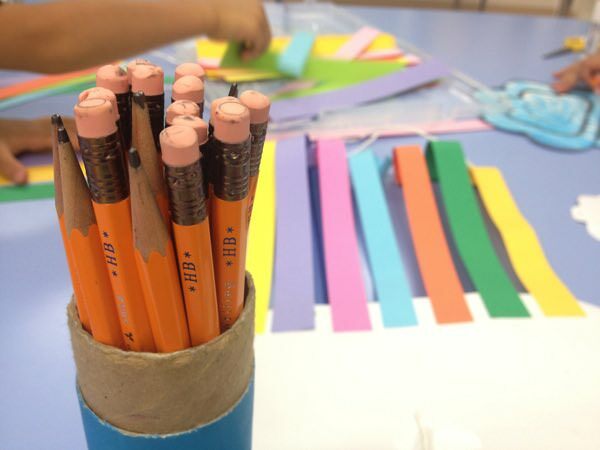 Using a guillotine for speed and neatness chop up a selection of colored craft papers. 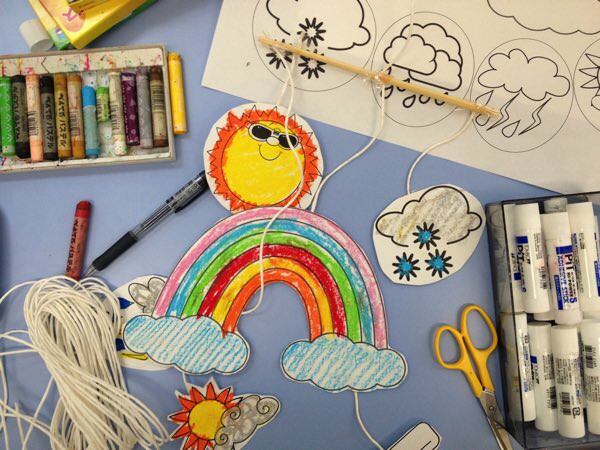 Have the children glue white craft paper to the back for rigidity. Japanese craft paper is a different size to international paper so I couldn't feed it through photocopier easily. 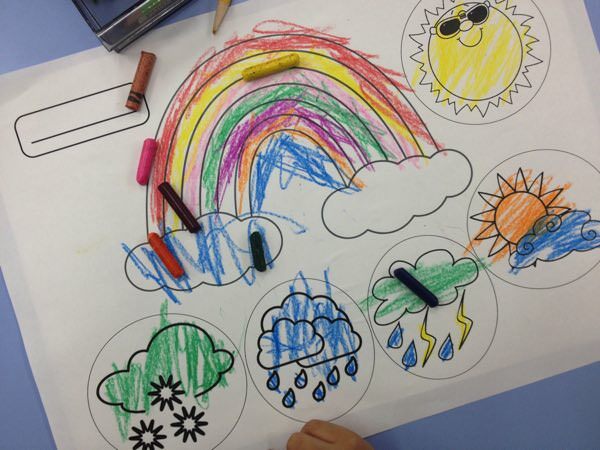 Colour then cut out the clouds. 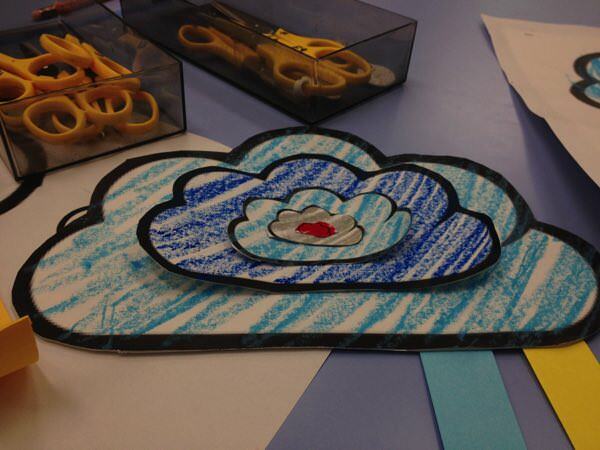 Put a blob of glue in the centre of each cloud and stick the next cloud on top. 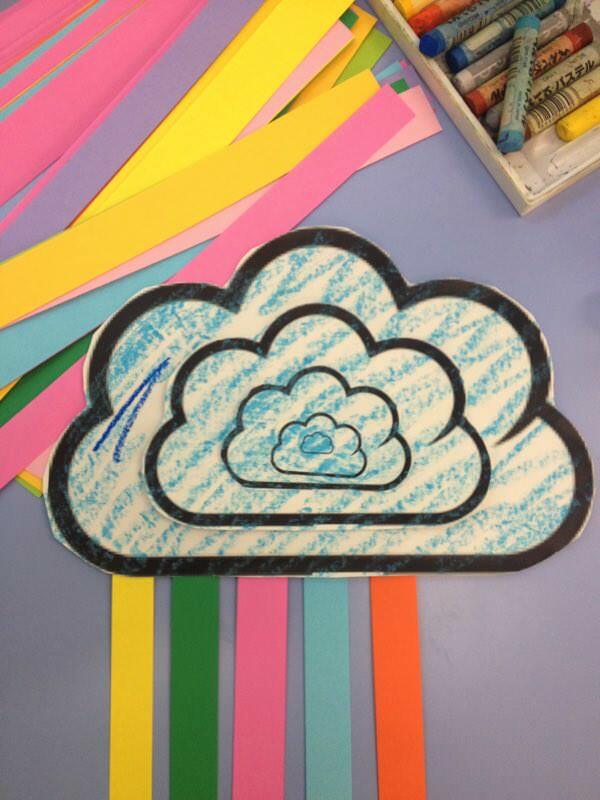 Turn the cloud over and glue strips of coloured paper. 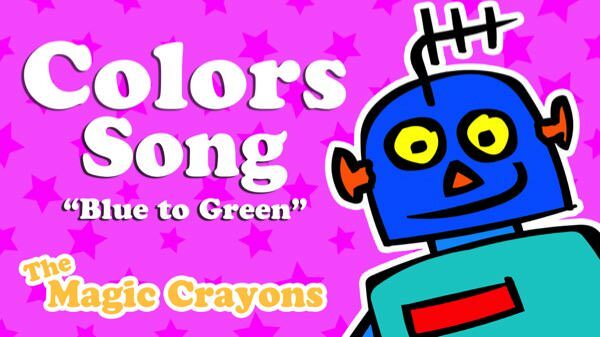 I said they couldn't use the same colour twice to keep it looking like a rainbow. 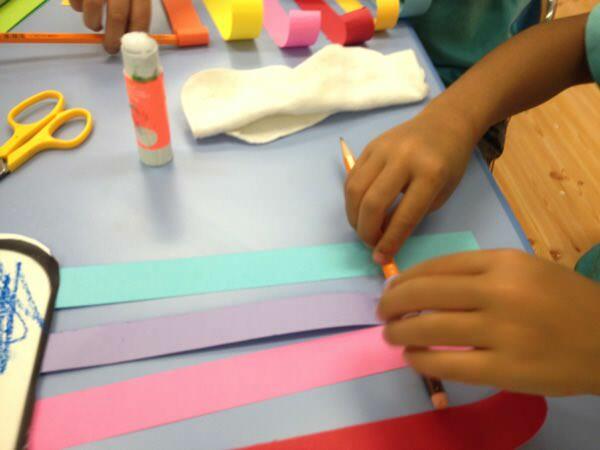 Using a pencil roll up half of each colored strip to add a curl. 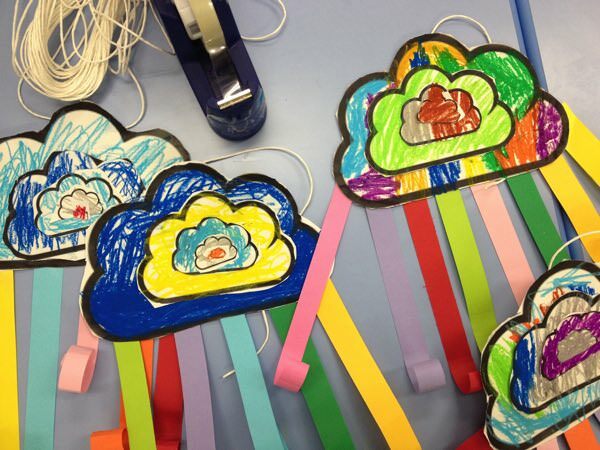 The children taped a precut piece of string to the back of the cloud so they could hold it on the way home then hang it up at home. 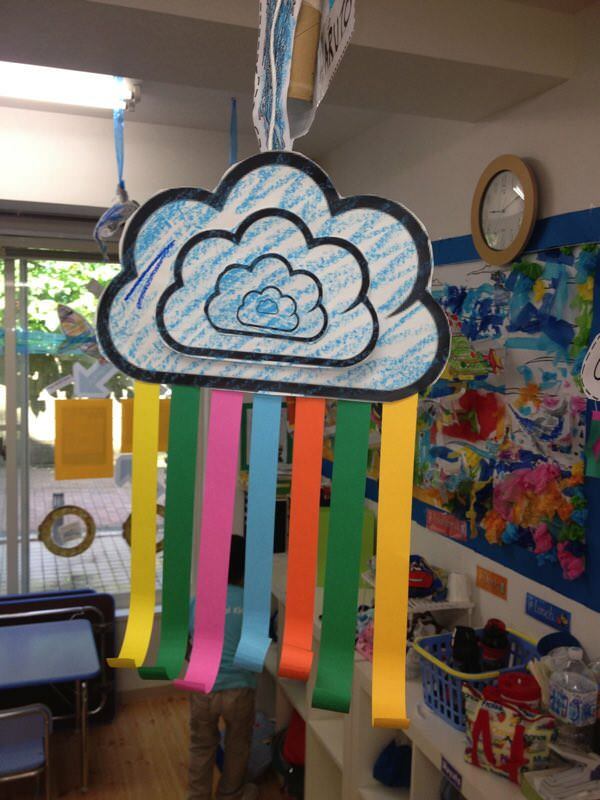 It's still The Weather Unit this month and given how much my students enjoyed making the Clouds And Rainbows Craft, I thought we could do another mobile ! 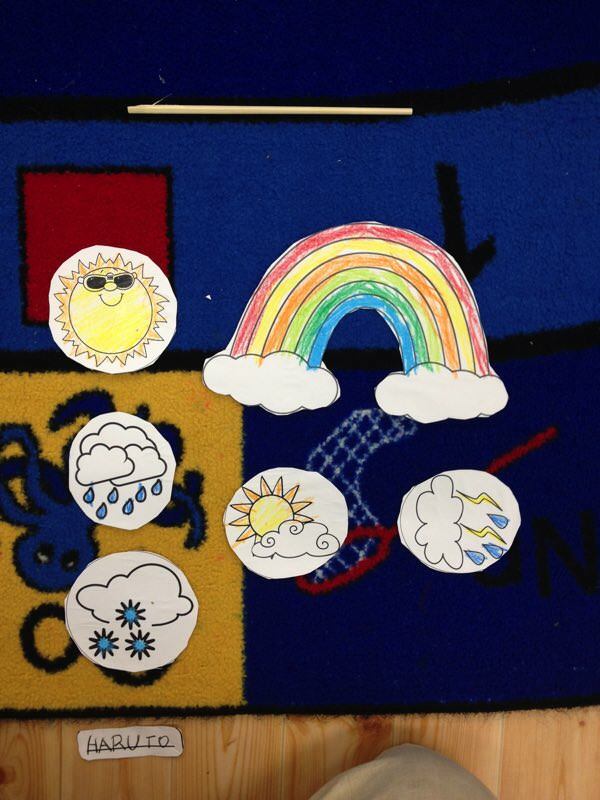 Draw on A3 paper or search google images for different weather types - rainy, stormy, snowy, sunny, party cloudy, and a rainbow. 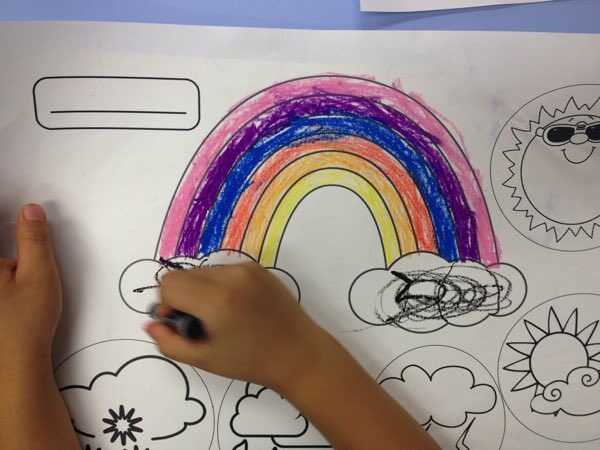 Choose images with a nice thick black border as it makes it easier for younger ones to colour in. 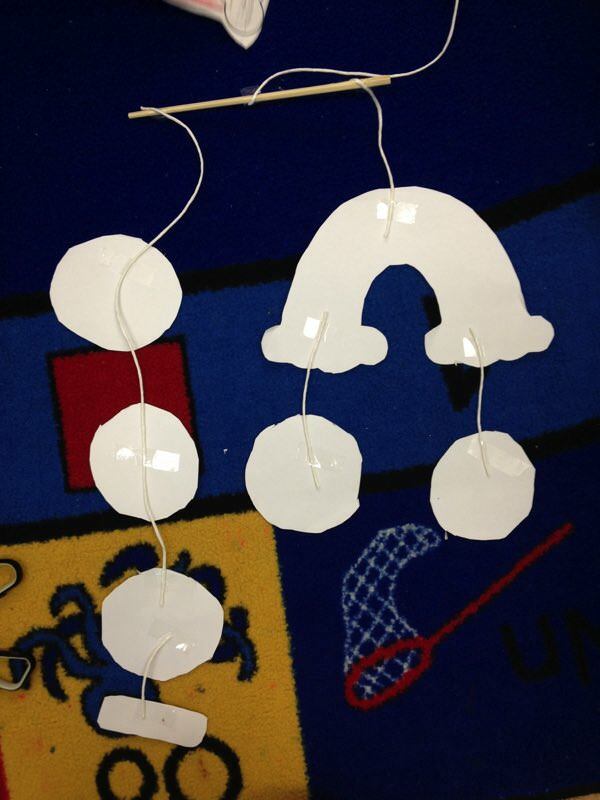 To aid with cutting I drew a small circle around each graphic. 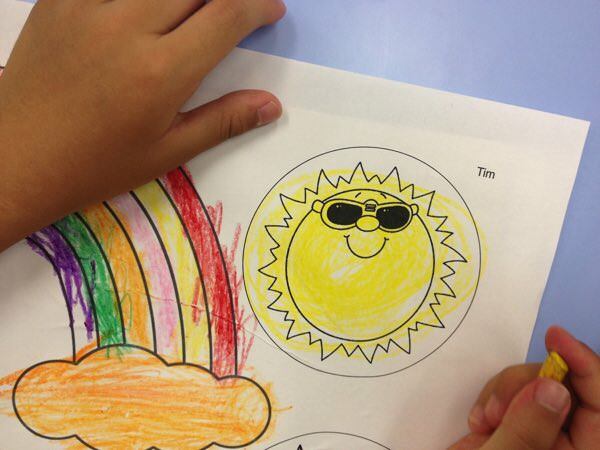 The sun would have taken forever to cut out otherwise. 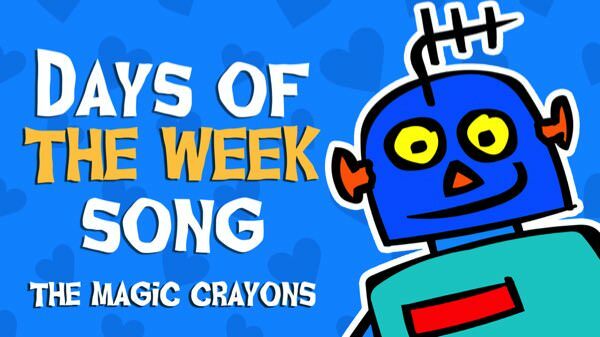 Run through the colors, there are plenty of songs that do this better than chanting or flash cards. 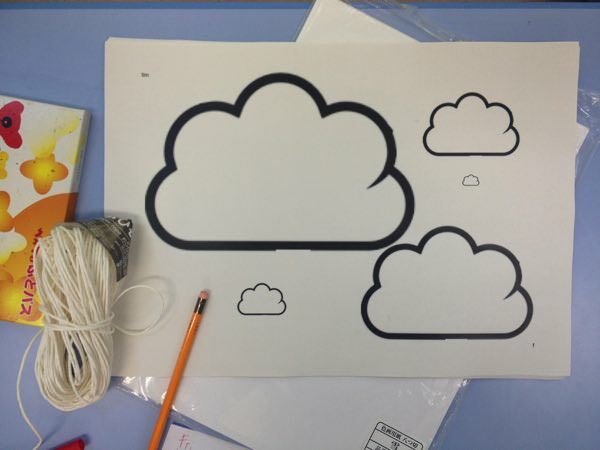 For rigidity I had the students glue the A3 print out to construction paper. If my photocopier worked better I would have printed directly onto it. 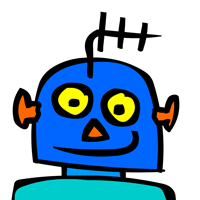 It's then basically colour in the images and cut out. 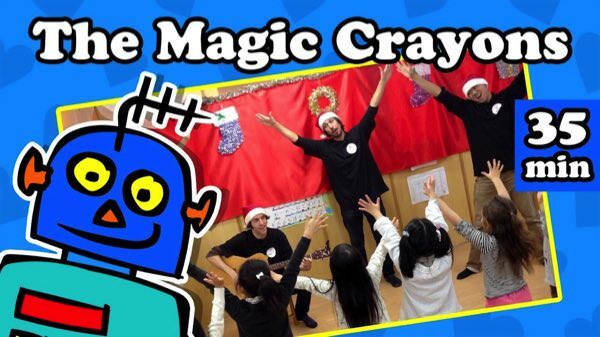 It will depend on your class size and ability as to whether you or the students assemble everything. I arranged everything face up, then flipped them over. So that it hangs correctly you will need an even number of objects hanging from each end of the chop sticks. A coat hanger would work just as well I imagine. I made an extra label for each childs name.